ADDRESS DRIVE BY`S I can`t allow drive by`s it disturbs the current guest because you have to go down the driveway to see it and you have to drive by all the picture windows, turn around and drive by them again to get out. I need to protect everyone`s privacy, I do hope you understand. AS YOU CAN SEE BY THE SURROUNDINGS,IT IS BUILT IN A BLIND VALLEY. HOME IS LOCATED IN THE BROADMOOR,A VERY UPSCALE NEIGHBORHOOD. This cheerful and luxuriously furnished home is set high up in the foot hills of the Rocky Mountains on the outskirts of Colorado Springs, Colorado. 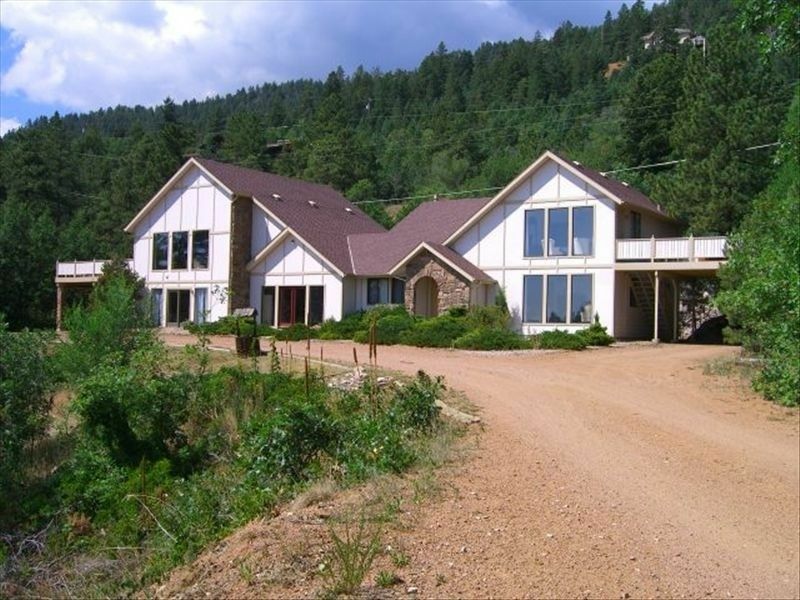 This home is located in upscale neighborhood ten minutes from the Broadmoor Hotel and offers an excellent value for families, couples, or business persons looking for a secluded home to get away from it all. Why stay in a cramped hotel? The rooms are spacious and exceptionally well maintained. This Swiss Chalet has five beautiful bed rooms, four queen beds, and two king-size bed. The country kitchen is complete with dishwasher, stove, oven range and refrigerator, and features Italian marble tile flooring. For dining, you will enjoy the attached breakfast nook as well as the formal dining room. Both sitting room AND the family room are great for entertaining or just relaxing. Although secluded in the foothills, tourist attractions such as Seven Falls, The Cheyenne Mountain Zoo, the Cave of the Winds, Manitou Springs, Garden of the Gods, and Pikes Peak are all within a very short drive. The drive from the Colorado Springs Airport is only 20 minutes. The Swiss Chalet style Townhouse is very popular with it`s 5800 Sq.Ft.living plus 1275 sq.ft.of deck. Our family getaway staycation was great at this property. We were able to get everything we were trying to do in the Springs done, and we greatly appreciated the option to check in early. Thanks Tom! We were blown away by the house and had a really wonderful time. We especially enjoyed the view and being able to relax in the sauna! Best place for a relaxing weekend! This is the 2nd year we have stayed and it just gets better every year! There is so much space and everything you would need for a relaxing weekend. We will definitely be coming back! When I was looking for a vacation home, I found several that would have been adequate. I had contacted several home owners with some questions. I was looking for one that had plenty of room, that could accommodate our family of four grown kids with their families. One question for Mr. Thomas was a picture of the night over looking Colorado Springs. He assured me it was from the house. This house quickly rose to the top for consideration.On the first afternoon, I texted Mr Thomas to let him know we had arrived. I mentioned how we liked the house . He said just wait a little while for the lights in the city to come on. WOW! When they came on it was like a shimmering jewel. The views from this house are unbelievable! There was more than enough room for all of the families to spread out and plenty of room for us to all be together as well. We saw mule deer in the yard and all around the area as we traveled back and forth. This house is conveniently located but had the feel of being secluded on the mountainside. We have rented quite a few cabins and houses from the Smokies to the Rockies. This by far is our favorite. Great place to gather with many families of many ages. Well equipped with all the necessities for cooking, technology set up, sleeping arrangements plentiful. Lots and lots of space for many people to enjoy different things at the same time. Beautiful views above Colorado Springs. Only negative was the hot tub never felt warm enough to enter. There was a 2nd hot tub that had water but did not appear to be heated at all.